Traditional European Style Upholstery Sofa offered to you by Homey Design. Add value to your home décor by getting this Traditional European Style Upholstery Living Room Set by Palazzo Royale HD-1626. The design, detail, and style beautifully connect form and function and endure the test of time. This traditional set includes a sofa, and left and right facing chaise that are upholstered in elegant, soft leather and complemented with decorative accent cushions for maximum comfort. Each item is accented with intricately carved wood trim frame that runs along the arms, back of the seat top, and bottom panel for an eye-catching look. The elegant-looking carved cabriole legs accent the look for added appeal. Traditional European Style Upholstery Sofa offered to you by Homey Design. Add value to your home décor by getting this Traditional European Style Upholstery Living Room Set by Palazzo Royale HD-1626. The design, detail, and style beautifully connect form and function and endure the test of time. 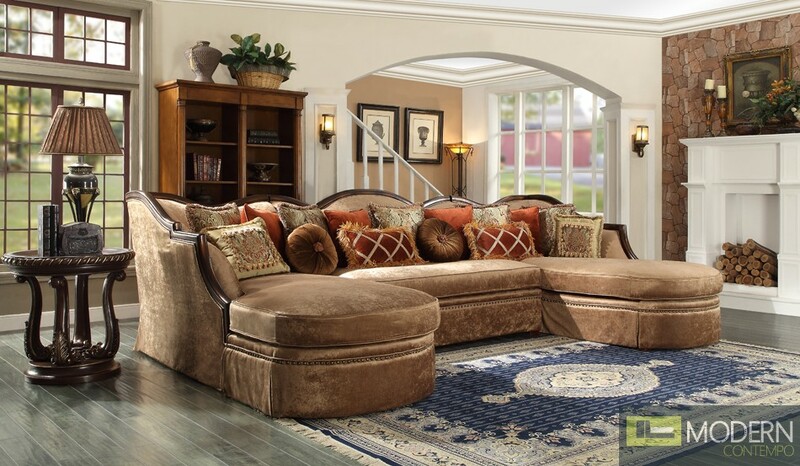 This traditional set includes a left and right facing chaise and a sofa that are upholstered in elegant, soft chenille fabric and complemented with decorative accent cushions for maximum comfort. Each item is accented with intricately carved wood trim frame that runs along the arms, back of the seat top, and bottom panel for an eye-catching look. The elegant-looking carved cabriole legs accent the look for added appeal.